You know who does great mapping and directions services? Google. What if you could combine their fantastic mapping and place services into your vehicle, without having to mount your mobile phone? Kia is ready to make this dream a reality in their upcoming Kia UVO system, and will debut their Google powered system in the 2014 Kia Sorento CUV in Q1 of 2013. This is actually the second generation of the UVO system, but this years models should come with some major changes as Google takes over Microsoft in Kia vehicles. Car owners will be able to manipulate their Google service through the device screen or from an Android powered device, with the Send2Car feature. The UVO app for sending information to the car isn’t slated for release until Q2 of 2013, so new owners will need to wait a few months for full functionality. The system will integrate the Google Maps and Points-of-Interest (POI) services into the dash of the Sorento, followed later by the Kia Forte and then the remainder of their 2014 lineup. The UVO system includes many other features that you might expect from an advanced vehicle infotainment system. Features include Vehicle Diagnostics, Parking Minder, Roadside Assistance, 911 Connect, Music Control (CD/Radio/USB) and much more, almost all of which is available through a hands-free system. Kia Motors America (KMA) today announced it will work with Google to provide content and search-based solutions enabled by Application Program Interfaces (APIs) for the second-generation of the automaker’s innovative UVO eServicestelematics system. These new solutions will initially be introduced on the new 2014 Sorento CUV. The immediate integration of Google solutions will utilize Google Maps and Google Places to acquire driving directions and locate Points of Interest (POIs) in a seamless and organic manner. KMA and Google look forward to continuing to work together to bring innovative navigation solutions to enhance the connected car experience. UVO continues to offer drivers hands-free mobile phone management capabilities and hands-free control of music from a variety of media sources, including CD, radio, USB, media player, and the Digital Jukebox. 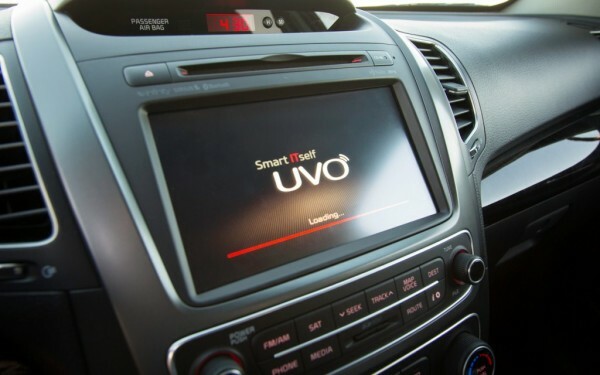 With UVO eServices, users will now be able to control the 2014 Sorento’s on-board navigation system through voice commands when the vehicle is outfitted with the UVO eServices/navigation package. Also new with UVO eServices is an enhanced telematics suite that offers a number of maintenance and infotainment functions, including 911 Connect, enhanced Roadside Assist2, Automatic Diagnostics, Manual Diagnostics, Scheduled Diagnostics, vehicle maintenance, and eServices Guide, many of which are run through the owner’s Smartphone equipped with the UVO eServices app available at no charge3. Advanced Voice Recognition makes it simple to operate many of UVO eServices functions, including the Sorento’s voice activated navigation system. USB connectivity allows users to download music files from a memory stick into the Digital Jukebox. The large eight-inch touch screen is easy to operate and incorporates Sorento’s rear camera display4, Infinity®5 Premium Sound System and My POIs (personal Points of Interest via online maps), a feature that makes it easy to customize the owner’s most visited locations. UVO eServices is compatible with iPhone®6 at launch and Android® phones are expected to be compatible in the second quarter of 2013.
eServices Guide: Accessed via the touch-screen or voice command, eServices Guide places a phone call via Bluetooth® hands free connectivity7 to a voice response system that explains UVO eServices to the driver in an interactive manner. Car Care Web: Through the UVO eServices owner’s portal, known as “Car Care Web,” owners can check vehicle diagnostics, vehicle status, maintenance schedules, driving behavior, and schedule appointments with their preferred or nearby dealer via their home computer or mobile device. Owners also can earn awards for safe and eco-friendly driving viewable on Car Care Web should they rank high enough among their fellow UVO eServices owners. My POI: Also available to UVO eServices owners is My POI, a feature that allows owners to send a destination from Google Maps through their Smartphone to their UVO eServices vehicle. In the convenience of their home or office, the customer selects a destination from the Web via Google Maps, once the customer’s Smartphone receives the destination it will send the destination to the vehicle’s navigation system the next time the Smartphone is paired via Bluetooth® wireless technology. In addition, all destinations sent from Google Maps will be copied to the owner’s Car Care Web. (My POI is only available with UVO eServices vehicles equipped with navigation). Vehicle Diagnostics: If UVO’s eServices identifies a problem by way of the Automatic Diagnostics function, it will communicate the vehicle’s issue(s) and its location to Kia’s 24/7 call center or will schedule an appointment online with the nearest Kia dealership upon user request. With Manual Diagnostics, at the owner’s preference, UVO eServices can connect the user with Kia’s 24/7 call center or schedule an appointment online with the nearest Kia dealership, should an issue be found. Additionally, the user can take advantage of Scheduled Diagnostics from their Smartphone, setting a monthly diagnostic check of the vehicle. Upon completion, any issues found are automatically forwarded to Car Care Web. 911 Connect8: In case of an airbag deployment, the Crash Notification Assist function will alert emergency services. During a 10-second window, the driver has the option to cancel the call, otherwise UVO eServices will dial 9-1-1, read the vehicle’s location out loud to the emergency services operator and allow the operator to speak with the vehicle occupants. Parking Minder: If the driver happens to forget where they parked the car, the Parking Minder function helps find it by sending the location of the vehicle to the driver’s phone. If preferred, the owner also can take pictures of the surrounding area for reference, write a reminder note, email his or her location and set an alarm if the car is parked at a meter. To guide the owner back, the UVO eServicesSmartphone app will display the owner and the vehicle’s locations on a map.